In 1970, Jaguar Land Rover Minneapolis (JLR) purchased the British Leyland Franchises from B&K imports and moved them to their newly constructed facility in downtown Minneapolis. This state of the art, all enclosed building, included two levels of show floors and three levels of service. JLR sold and serviced MG, Austin Healey, Austin Marina, Jensen, Triumph, Jaguar and Land Rover. In 1981 British Leyland stopped production on all models except for Jaguar and Land Rover. JLR was the largest British Leyland car dealer in the Midwest and continues to service and sell collectable English cars. JLR specializes in MG, Austin Healy, Triumph, Lotus, Jensen along with Jaguar and Land Rover. Since 1970, JLR has been the leading authorized Land Rover, Jaguar and Lotus dealership in the Midwest, both in sales and in service. 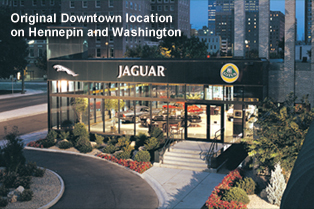 In 2007, JLR moved from their Downtown location into their new state-of-the-art facility in Golden Valley, Minnesota. With a steeped history of British automobiles, JLR has a staff of knowledgeable experts both in sales and service. JLR is one of the only Jaguar Land Rover dealerships in the United States to specialize in classic car sales and classic car service. You can buy a timeless piece of British automotive history with the confidence that your purchase will be handled but the Midwest’s leading expert in Classic British cars.